Hello there! My name is Sophia. I’m one of the sweetest dogs you’ll meet. My favorite pastime is cuddling. When I’m not busy doing that, I’ll be giving you kisses. I don’t ask for much. I’m happy just to be with my person. I’m not just a sweetie, though. I’m smart, too! I know how to sit, give paw, and lay down. Give me a treat and I promise you’ll be impressed. And am I cute or what? Just look at this face! How can you pass me up? I’m a real catch. But don’t just take my word for it. Apply for me and come see for yourself! I’ll be here waiting for you. 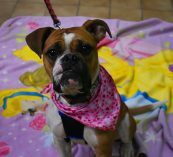 Sophia is a female Boxer mix, approximately 3 years old, up-to-date on vaccines, de-wormed, SNAP 4Dx tested, -x4, spayed and microchipped. 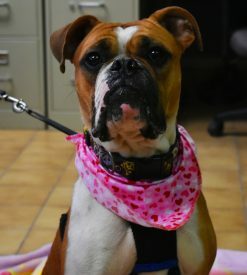 If you think sweet miss Sophia is the one for you, please fill out an application in person, or on our website at lawrencecountyhumane.com. 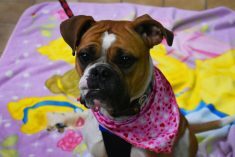 Sophia can’t wait to meet you!